Snowdrops are one of the earliest signs that winter is slowly winding down – the delicate white flowers poke through between January and March and are known to blanket woodlands in brilliant bright white. There’s nothing like some fresh air on a crisp, sunny day – and these woodland walks are the perfect excuse to get outdoors and see the snowdrops in February when they’re at their best. Known for having one of the finest displays of snowdrops in the country, visit Anglesey Abbey in Cambridgeshire and you can find more than 300 varieties on display, 20 of which were discovered on the grounds. The expansive grounds offer more than 114 acres to explore, and each path and walkway offers a new vantage point to see the snowdrops amongst the trees. While you’re there don’t miss the Winter Garden – it’s at its best this time of year. The seven-acre winter garden at Dunham Massey in Cheshire opened in 2009, with the expert design help of gardener Roy Lancaster OBE. 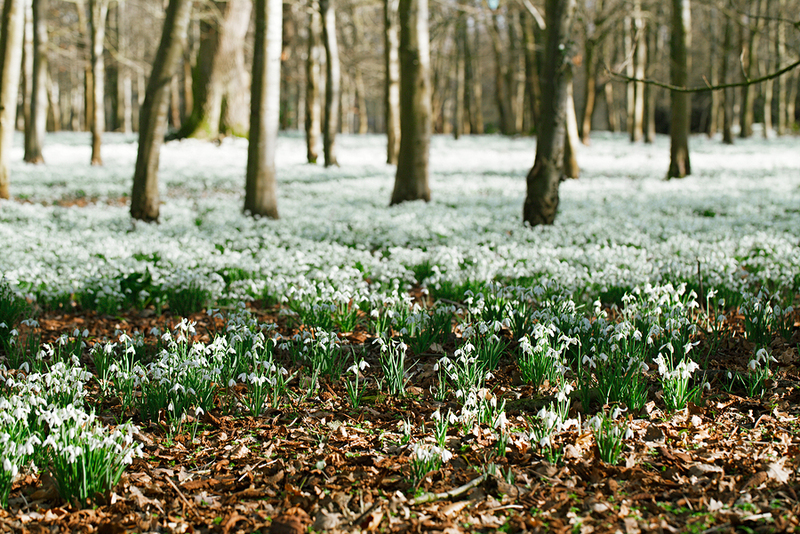 Some 200,000 snowdrops have been planted since then, creating a huge carpet of white and green for visitors to enjoy. Come back in spring for the next colourful display, when more than 20,000 narcissi come to bloom. The historic gardens at Fountains Abbey have one of the most stunning displays of snowdrops in the country and also boasts a World Heritage Site designation. Earl de Gray first planted snowdrops along the River Skell in the 19th century and it’s a tradition that continues to this day. Visit and you’ll find there are miles of trails to explore, plus beautiful footpaths for short-distance wandering. Known as ‘Stowedrop season’, Stowe’s beautiful landscapes are transformed in the early part of the year as the fields are covered in a blanket of white. The Elysian Fields, Sleeping Wood and Lamport Garden are three of the best ares to see the flowers in bloom. Wander the 250-acre grounds and you’ll also find plenty of statues, temples and other incredible artworks to capture your imagination. Will you take a walk down the Path of Vice, the Path of Virtue or the Path of Liberty? The grounds at Nymans are a haven for garden lovers, boasting a huge collection of rare plants. Mid-Feburary is the perfect time of year to plan a visit; around this time there are more than 150 different types of plants flowering, with bursts of colour dotted amongst the brilliant white Snowdrops. Where do you like to see the Snowdrops? Had Snowdrops in the front garden when I was a kid. I think they were one of the first flowers I knew the name of. They were white blue bells.